There are numerous brands and types of solar pool covers on the market, and this makes it difficult to know which cover suits your pool perfectly. In this article, we will look at some of the key factors you should consider when shopping for a pool cover and review some of the best solar pool cover products available today. So why should you trust our opinion when it comes to solar pool covers? Well, for a start our opinion and recommendations are based on hard research. We spent several days researching different features and other aspects of solar pool covers both online and offline. We watched video tutorials of more than 30 different products, read solar pool cover reviews from real customers who had bought and used the products, and even practically tested a good number of solar pool covers to determine their efficiency. Our research also involved a comparison of features and price points of different products. We went a step further and weighed customer opinions against what the manufacturers claimed about their products to find out which ones worked as advertised. In the end, we came up with a list of the best solar pool covers based on actual tests and research. What are Solar Pool Covers for? Which Factors Make the Best Solar Pool Cover? 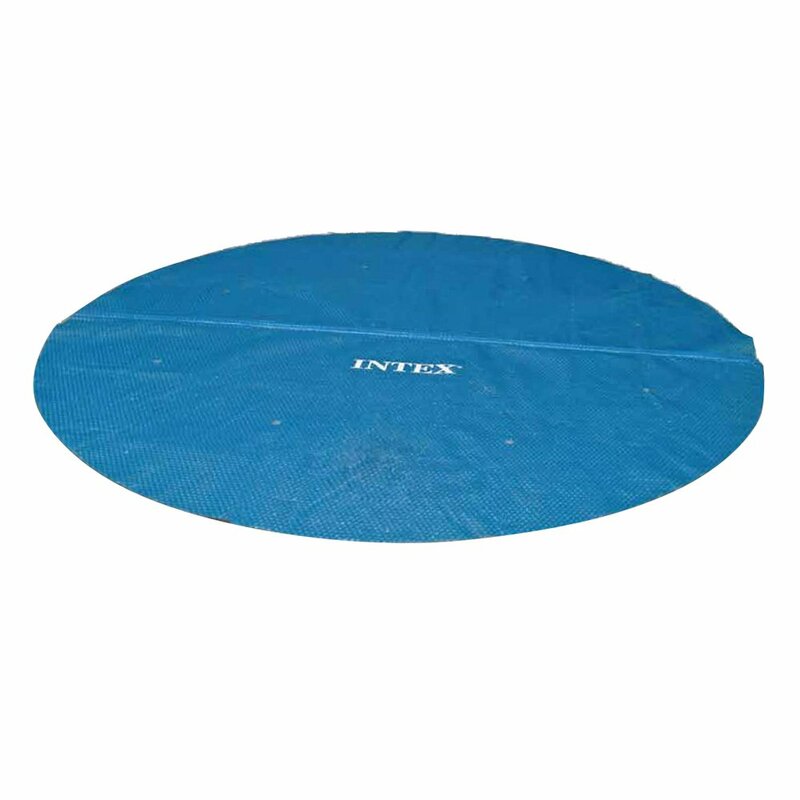 This Intex Solar pool cover is designed for round shaped pools with a diameter of 12 feet. It keeps your pool warmer, helps reduce evaporation by 95%, and is quite easy to use too. The pool cover has drain holes that prevent the accumulation of water on its surface and even comes with a nice reusable bag for easier storage. This is the right solar pool cover to get if you have a round frame pool. It’s made of a tough PVC material that can collect energy from the sun, keep your pool water warmer, and prevent excessive heat loss through evaporation. It has an air-bubble design that helps distribute heat evenly throughout the pool surface. The only downside reported by some of the pool cover’s users was that its air bubbles seem to disintegrate after long usage. This is expected given that most people have a habit of overusing pool chemicals such as chlorine which will inadvertently affect the pool cover in the long run. Keep your pool chemical usage within acceptable levels and your pool cover will last for a long time. 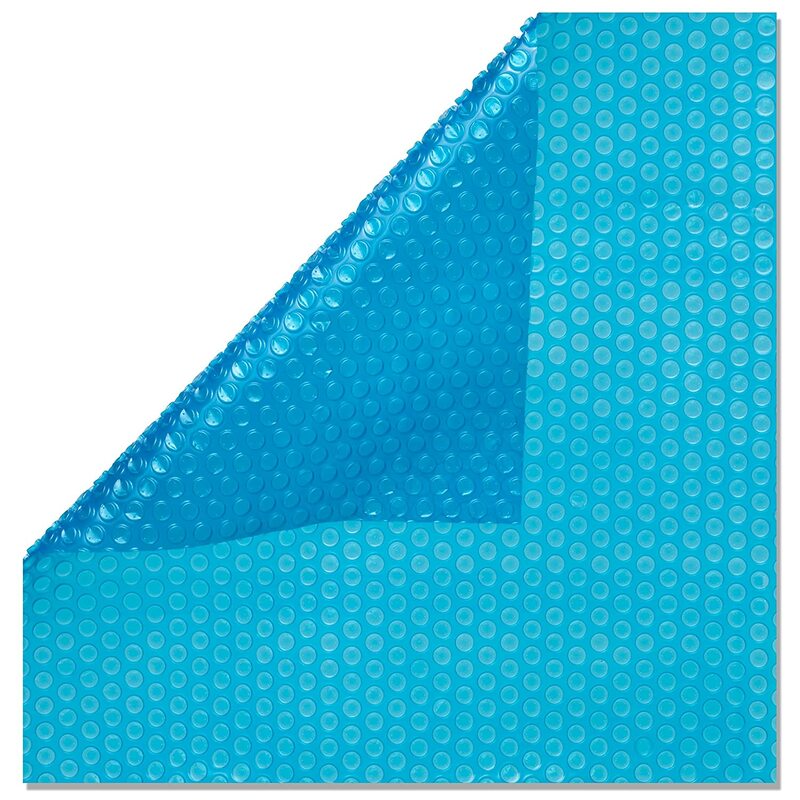 Available in an attractive blue colored design, this Sun2Solar Blue Solar Cover fits nicely around a rectangular 16 by 32 feet swimming pool. 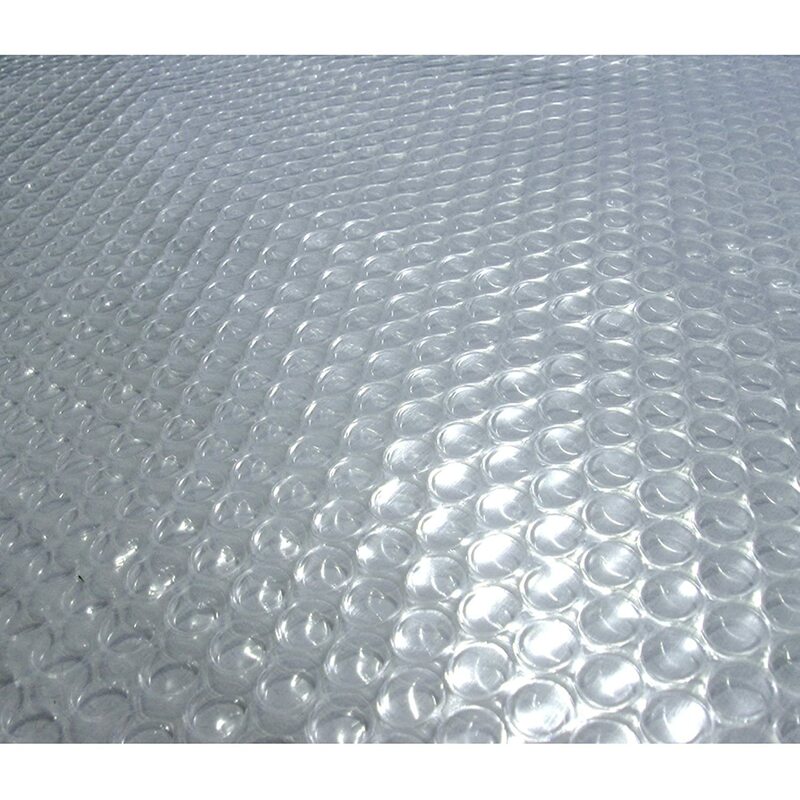 It features a film made of thousands of tiny bubbles that collect and retain solar heat to keep your pool warm at night and on cold days. The pool cover can prevent pool water evaporation by 95 percent. It has a trim to fit design that’s suitable for rectangular and other unique shaped pools. You can even cut it along the edge of down-facing bubbles to fit your type or shape of pool. Remember that trimming the cover doesn’t affect its warranty. If you’re looking for an attractive solar pool cover with a sporty look and reliable functionality, then the Sun2Solar Blue is a great option. It will help you save money on heating bills, pool chemicals, and keep your pool water in perfect swimming conditions at all times. You can even trim it to fit your odd-shaped pool. As the name says, the Blue Wave NS520 is designed for in-ground rectangular pools measuring up to 16 by 32 feet. It’s a 14-mil pool blanket that covers your swimming pool perfectly to keep off debris and use solar heating to keep your water temperature up by 15 degrees Fahrenheit. Your pool water temperature increases without the use of a heater. The solar pool cover even comes with insulating thermal bubbles that help minimize heat loss through evaporation. The bubbles create an insulating layer that protects your pool from nighttime cooling and cold winds. Made for in-ground pools, the Blue Wave pool blanket is chemical resistant and UV protected. It has superior durability to withstand damage due to long-term exposure to the sun’s UV rays and pool chemicals. It comes with a 6-year warranty from the manufacturer. It’s a functional, durable, and large enough blanket for your in-ground pool. 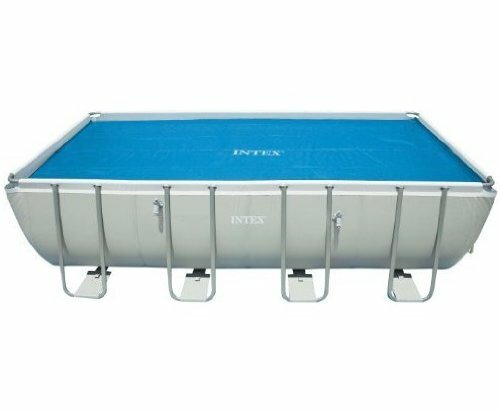 This Intex Solar Cover is designed for rectangular swimming pools measuring 18 by 9 feet. It has a 160 micron construction which ensures that your pool remains warm and fun to swim in at all times. The pool cover comes with a carrying bag for easy storage when you’re not using it on your pool. Another great advantage the Intex Solar Cover has over other rectangular frame pool covers is the fact that it’s extremely lightweight. It weighs slightly less than 5.5 pounds. It doesn’t exert a lot of pressure on your frame pool. It’s extremely easy to roll over the pool, easy to store in its convenient carrying bag and is made of strong materials. A few users claimed that it doesn’t last as long as other pool covers but durability often has to do with the type and amount of pool chemicals used in the pool and your location. Overall, this pool cover is a great option for anyone with a frame rectangular swimming pool. Available in attractive blue color, the Blue Wave NS110 is a decent looking 8-mil solar blanket designed for above-ground round-shaped pools. It has a diameter of 18 feet, which is large enough to cover a big round-shaped pool. The pool blanket has insulating thermal cells that can trap and retain heat on cloudy days to ensure that your pool remains warm all summer. Another great feature of the Blue Wave NS110 is its long-lasting construction materials. You obviously want to invest in a solar pool cover that will serve you for a long time. The NS110 is constructed with UV-protected polymer materials that can withstand chemical or UV-radiation damage. The 8-mil solar pool cover uses passive sun heat to increase your pool water temperature by 15 degrees Fahrenheit. It can also reduce evaporation by up to 95% and comes with a 3-year warranty from the manufacturer. If you own a huge round pool, this solar pool blanket from In The Swim is your best choice. It has a massive diameter of 24 feet, which is enough to cover most domestic round-shaped swimming pools. It has a sturdy heavy duty construction. It has a thickness of 8-mil and comes with reinforced flat seams for better attachment to the pool sides. The pool blanket also features thousands of air bubbles that help transfer solar heat evenly throughout the pool. This pool blanket is also very efficient in reducing evaporation, which often leads to a chemical loss in swimming pools. It helps you save time and money spent on chemicals and the tedious task of chemical rebalancing. You can even use this pool blanket on any oddly shaped pool simply by trimming it to fit your oval, kidney-shaped, or any other irregularly shaped pool. This guide would be incomplete without mentioning one of the best solar pool cover accessories – the Solar Saddle Pool Cover Holder. You need a cover holder to provide stability and a convenient storage system when the cover is not in use. The Solar Saddle Cover Holder easily mounts on the rails of an above-ground pool saving you the trouble of stretching your pool cover on grass or on the pool deck when it’s not being used. All you need to do is remove the cover from the pool and place it in the Solar Saddle which then folds in an accordion style. The holder provides a safe and convenient storage for the pool cover. When you want to cover the pool again, simply pull the solar cover across the pool. You may already be using a safety pool cover to keep out leaves and debris from your pool water. The solar pool cover works in a much better way. It not only prevents dirt and debris but actually heats the pool using energy from the sun. It keeps your pool clean and warm without the usual expenses of pool heaters. It helps you reduce your utility bills. A solar pool cover traps heat from the sun and transfers this heat to the pool water. It may not keep the water as warm as a traditional gas or electric heater does depending on your location but it does save you money by preventing evaporation. Another good thing about solar pool heaters is their ease of installation. They are also widely available at affordable prices. You may want to know how pool water is heated before you invest in a solar pool cover. Pool water heating is measured in British Thermal Unit. A single BTU is the heat needed to increase the temperature of a single pound of water by 1 degree Fahrenheit. It’s equivalent to one lit match. So, for example, if you like to maintain your pool at 80 degrees F, an evaporation of just one pound of water takes away a heat amount of 1,048 BTUs. That’s a lot of heat and water loss. It’s also money lost in energy bills. Water loss due to evaporation can also be quite significant depending on where you live. An uncovered pool in Arizona can lose as much as 4 to 6 feet of water in a year. So how do you prevent heat and water loss in your swimming pool? You can do it by using a solar pool cover. A solar pool cover reduces water and chemical evaporation. It helps you prevent heat and water loss from your pool in two ways. First of all, it retains the heat already in the water by preventing evaporation. The cover provides a physical barrier on the water surface to prevent evaporation. Secondly, the pool cover acts as a magnifying glass to amplify heat energy from the sun and create a warming effect on the water. You must know how a magnifying glass converts heat energy from the sun if you’ve held one against a piece of paper on a hot day. However, not all solar pool covers are created the same. Some work better than others so it’s important to find the right one for your pool. The type of pool you have. Do you have an above-ground or in-ground pool? What’s the size of your pool? These are some of the questions you’ll need to ask yourself in order to find the right solar pool cover that will fit your pool perfectly. You may also need to invest in a reel to make things easier. Ease of use. There are basically three types of solar pool covers namely the manual, semi-automatic, and automatic pool covers. Manual covers require physical effort to work while semi-automatic and automatic covers use an electric reel to cover and uncover the pool. Automatic covers are convenient and easy to use but more expensive than manual models. Construction materials. The best solar pool cover material is vinyl which is more resilient and provides better heavy duty protection than other materials. Solar pool covers come in a variety of colors but we recommend going for darker hues because they provide better protection from evaporation. However, don’t go for one that’s too dark as it keeps your pool water cooler than you want. Material thickness. The efficiency of a solar pool cover is affected by its thickness. Go for a thicker cover that will not only trap heat better but last longer too. Pay attention to the cover’s design too. 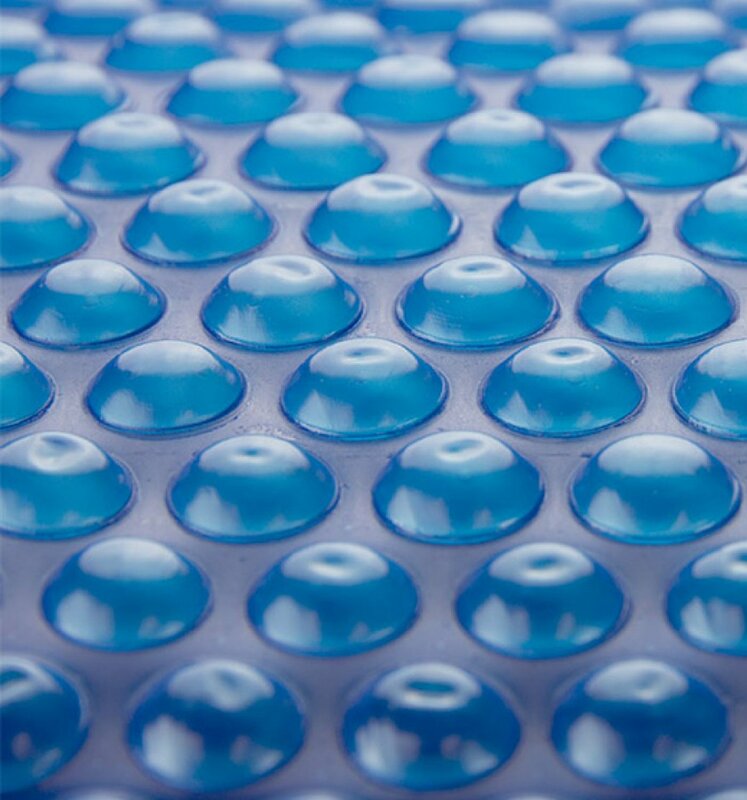 Go for a cover featuring tiny bubbles or hexagons that help distribute heat evenly. Always leave a 2 to 3-inch flap on the skimmer to help you tuck the cover under the skimmer’s edge. Never stretch out your solar pool cover on the lawn to dry because it will burn your beautiful green grass. We all want to enjoy the convenience of clean, debris-free, and well-heated swimming pools but often find the hassle of frequent pool vacuuming and high utility bills quite exhausting, to say the least. As nights grow longer and the air becomes colder, your pool’s water temperature drops and swimming no longer appears on your list of leisure activities. However, life doesn’t have to be that depressing if you buy a solar pool cover. With a good solar pool cover, you’ll be able to raise the temperature of your pool water while keeping out leaves and other debris. Get one that best suits your pool type and size from our list above. Previous articleAbove Ground Pool Reviews 2018: Read or Miss Out! Glenn has his roots firmly steeped in the beautiful seaside residences of Florida. By the age of 35, he starts his on water treatment company called WaterMan. Where he applied much of what he learned to serve the local pool owners. Best Pool Filter to Buy: 2018 Definitive Guide! The Pool Cleaner Experts is perhaps one of the best online information sites for pool products and water treatment solutions. With Glenn’s experience and knowledge and Joel’s user experience and technical ingenuity, The Pool Cleaner Expert is an authentic guide for all your pool related problems.